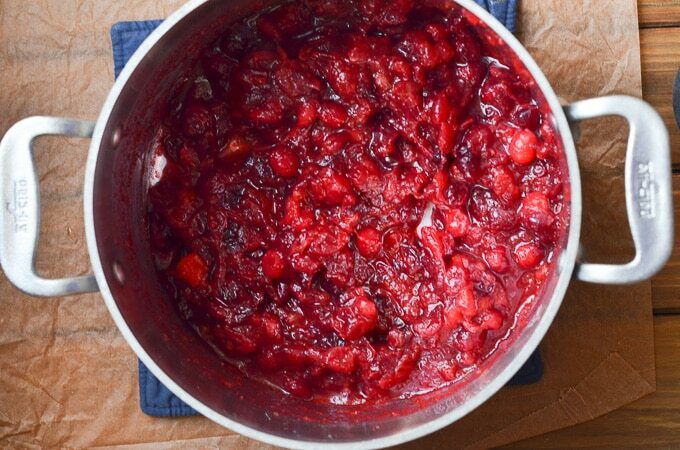 Home » Dairy Free » Easy Paleo Cranberry Sauce! 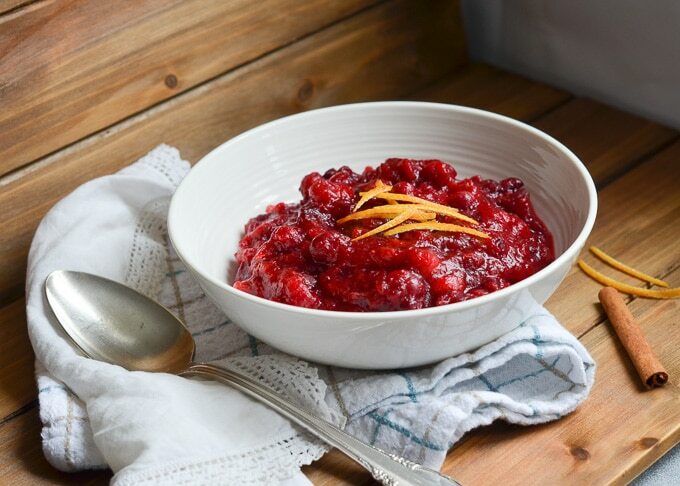 Paleo Cranberry Sauce is a favorite, delicious, super easy recipe that is perfect for your holiday table or everyday occasions! Just a few ingredients are needed, about ten minutes and your house will have the aroma of the festive holidays. Grain-free, gluten-free, dairy-free and vegan! Can be made ahead of time and freezes well. 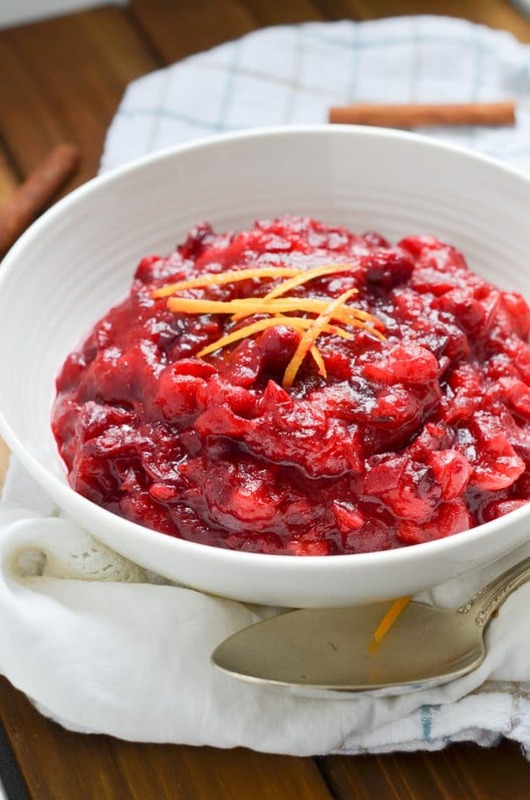 You’ll never buy store-bought cranberry sauce after making this one! Step 1 – Gather the ingredients. Zest and juice the orange, zest the ginger and measure the other ingredients. 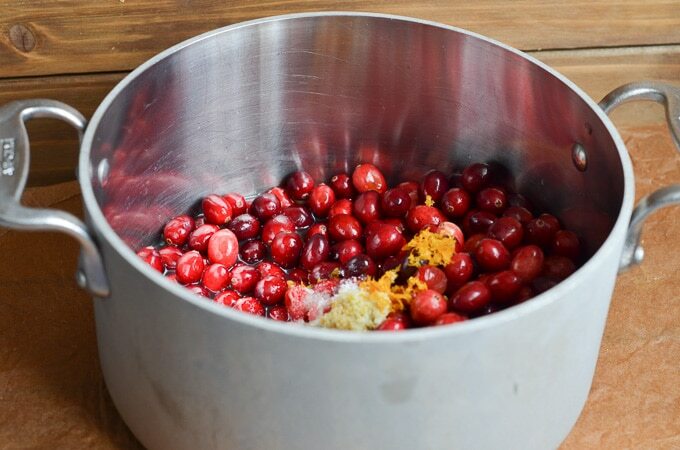 Tip: save the scraps and a few cranberries for a festive holiday idea I share later in this post. Step 2 – Add all the ingredients to a sturdy pot. As I’ve said before, I love my All-Clad pots which I’ve had for years. Step 3 – Stir the ingredients in the pot so they are well combined. Step 4 – Cook on medium-low heat for about ten minutes until all the cranberries have popped. Step 5 – Let the cranberry sauce cool. Add a garnish of orange curls if desired. Store in the refrigerator until ready to serve. Should last several days in an airtight container in the fridge. I would say this recipe would serve about 4-5 people, so if you have a larger group, you may want to double, triple, etc… this recipe. In my opinion, it is better to have too much than not enough. Plus, we all know how we all love leftovers. What if there were no leftovers? No way, bring on the leftovers! Clean out the pot used to make the Paleo cranberry sauce. Fill about 2/3 with water. Cut the leftover orange peel into slices and toss into the pot of water. Toss the ginger peels into the pot. Bring to a low boil and then simmer for a few hours, keeping an eye that the water does not evaporate. Add more water if needed. Your house will smell like the holidays. Dried ginger can be substituted for fresh, start with 1/2 teaspoon and taste test, add more if desired. Ground cinnamon and nutmeg can be added for additional flavor. Add a pinch of each. Omit orange juice if desired and add water to replace the liquid. Can substitute honey for the maple syrup. 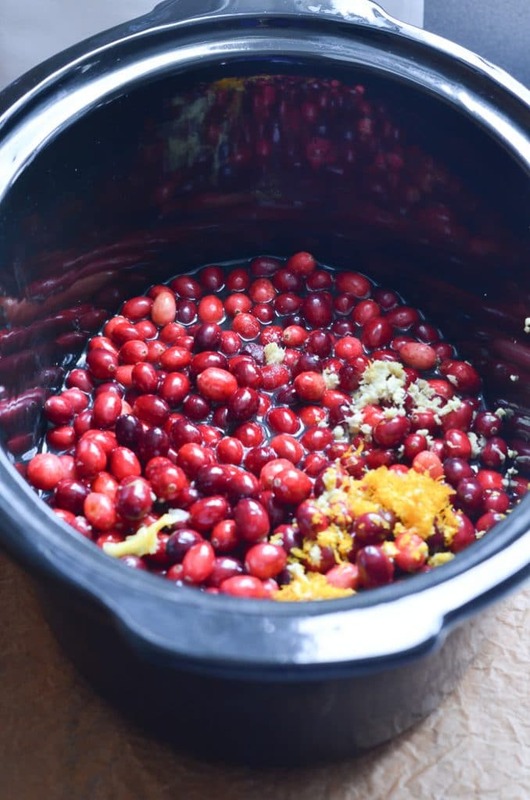 Can The Cranberry Sauce Be Made In The Slow Cooker/Crockpot? Yes – cook on high for 2 1/2 hours and then turn off heat and let cool. 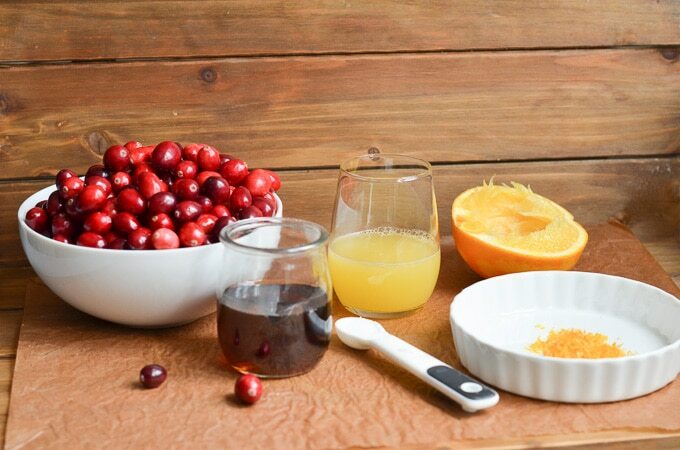 This is a delicious and easy Paleo cranberry sauce that gets a little kick from fresh orange juice and ginger. Wonderful for holidays, but so simple and great for everyday meals. Grain-free, gluten-free, vegan and dairy-free. Place all ingredients in a pot on your stove over medium heat. 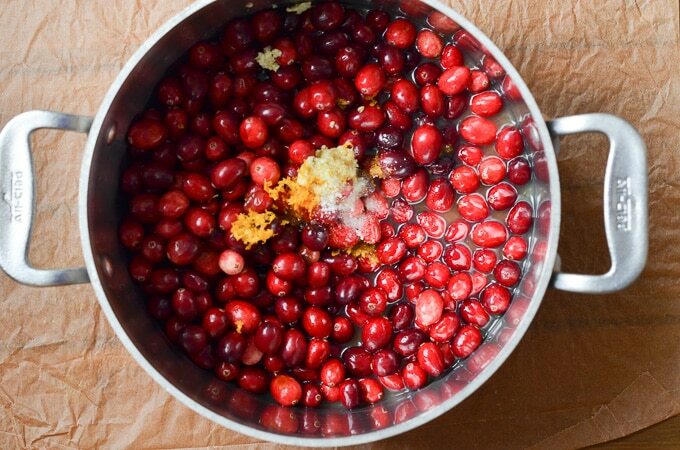 Bring to a boil and then reduce to medium-low heat for about 10 minutes until cranberries have popped. Store in an airtight container in the refrigerator. Is great made ahead of time and freezes well. Works in the slow cooker - cook on high for 2 1/2 hours. Update Notes: This post was originally published on November 23, 2014, but was republished with an updated recipe, new photos, step by step instructions and photos, success tips and a video in November 2018. I made this recipe (in my slow cooker) this year for Thanksgiving. My usual recipe for cranberry sauce was very labor intensive. This recipe went over great although I didn’t forget the orange peel garnish. This will now be my go to cranberry sauce recipe. Hi Dawn! Thanks so much for your comment and glad you love the cranberry sauce! Oh yes, I understand the need for an easy Thanksgiving side dish and this is it! I plan on making this a holiday regular dish with turkey.